Park visitors (ages 10+) can zip, swing and climb through the trees on a treetop adventure course! 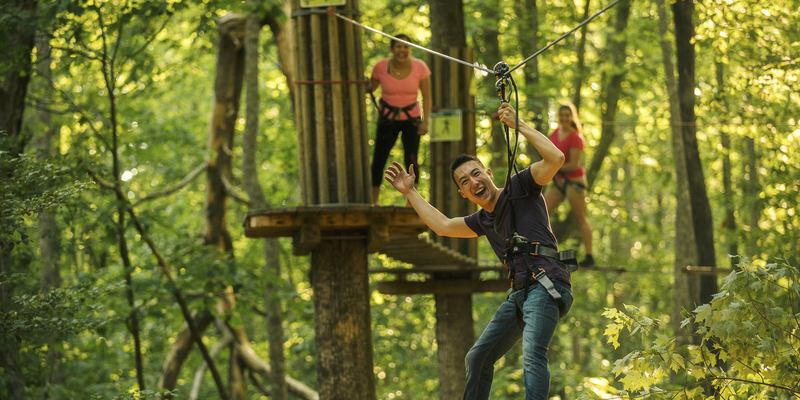 Go Ape is a great outdoor adventure for families, friends and groups. The course is set within a gorgeous pine forest and borders Pine Lake, one of the Shelby Farm Park's 20+ bodies of water. Your group will be equipped with harnesses, pulleys and carabiners, given a 30 minute safety training, and then let loose into the forest canopy, free to swing through the trees. Hours of Operation: Times and dates vary based on weather and course availability. Booking: Reservations are required. To book your Go Ape experience, please click here.